Our school district is involved with a statewide pilot program to revise teacher and principal evaluation. Here are some of the thoughts and resources I shared at yesterday's school district level meeting. We started today's meeting with this presentation by Bill Gates on the Measures of Effective Teaching (MET) study and how our country needs to provide meaningful feedback opportunities to teachers. The talk features a segment on a highly effective English teacher using video of her own classroom for reflective purposes - what a phenomenal idea! Normally, when Teacher A asks Teacher B to observe his or her teaching, Teacher A asks Teacher B to watch for specific things. The limiting factor is the required time commitment for both parties. Filming one's own teaching and then performing self analysis and reflection on the video eliminates this potential time issue. 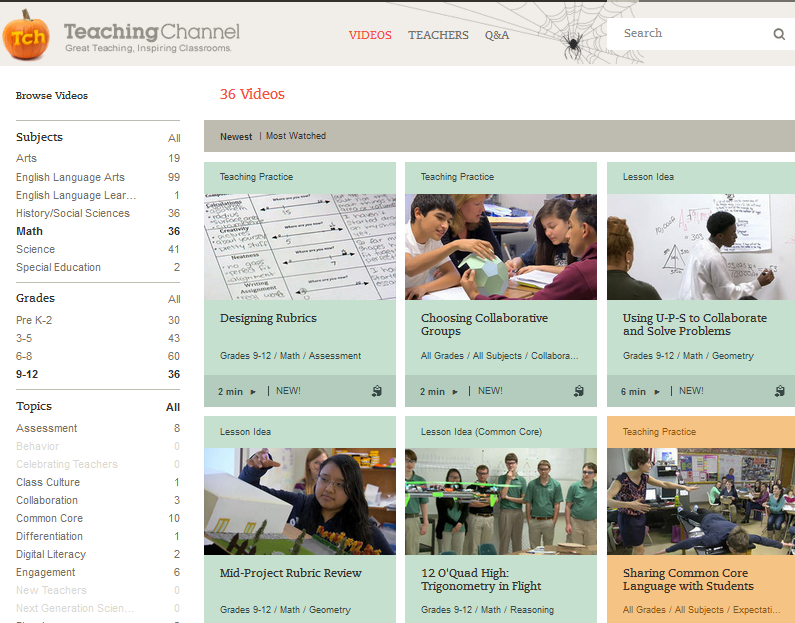 For more high quality videos of highly effective teachers, visit the Teaching Channel site. Below is an image of the video topics available at Teaching Channel and an actual screen shot of the site. 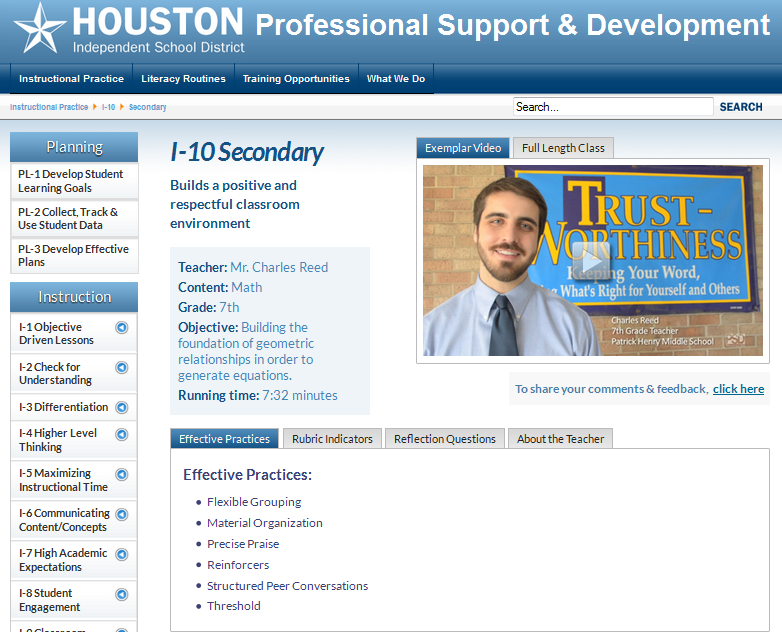 Another website with some interesting videos regarding teaching can be found at the Houston Independent School District Professional Support & Development Site. Houston ISD has its own instructional model with example videos of strong teachers modeling various elements of the instructional model. Much of our discussion focused on transitioning teachers from the perception evaluations are for firing to the perception that evaluations are for growth. Both Charlotte Danielson and Robert Marzano have great frameworks for teaching to help move instructors away from the limited feedback the word "satisfactory" provides and towards more effective instructional growth practices. 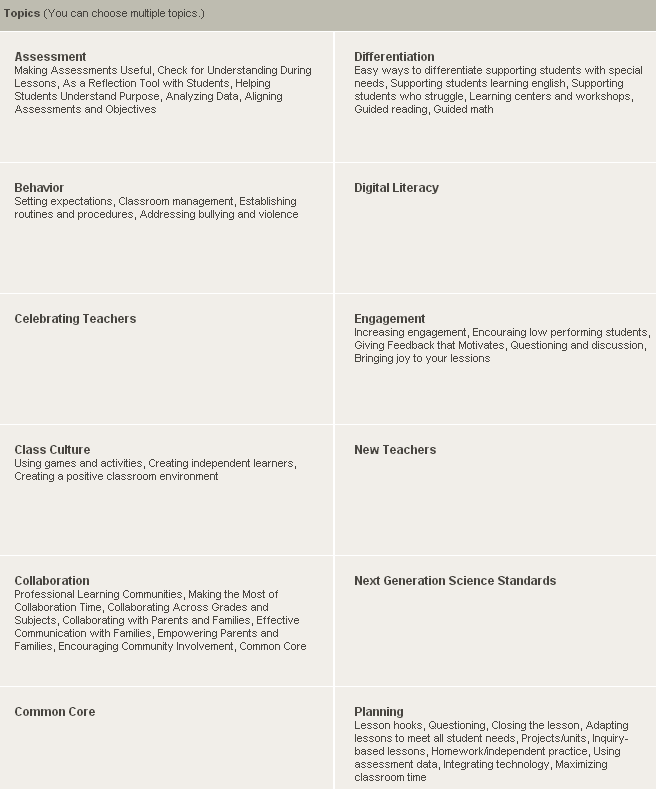 Posted in Professional Development, Teacher Evaluation, Teacher Resources on October 8, 2013 by Shelby Aaberg.